Mvskoke farmer Barton Williams is in the fields every day now, picking produce from two large plots sponsored by the Wilson Indian Community of the Muscogee (Creek) Nation. Williams is the community’s elected leader; he and several other dedicated volunteers are tending the typical garden fare—cabbage and okra, peppers and tomatoes—while fending off hungry deer, raccoons, squirrels, and insects. They’ve also planted a couple of distinctively Mvskoke crops: Indian pumpkins, which are good for frying; and safke corn, an heirloom variety used to make a traditional dish similar to hominy. Later in the season, they’ll offer low-cost food baskets to local residents. People are already asking when the corn will be in. Wilson Indian Community is also hosting training sessions with specialists from the state extension service and inviting other growers in the area to attend. The community center is next to the local high school, so this fall they’ll erect a greenhouse and get students involved in the effort. And some of the older folks have begun sharing heirloom seeds and laying plans to start a seed bank. “We didn’t realize how big this thing was really going to get,” says Rita Williams, Barton’s wife. All this in just their first few months as a Community Food Project funded by a small USDA grant, which they secured with the help of the Mvskoke Food Sovereignty Initiative. MFSI formed in 2005 when community activists and tribal government staffers began meeting to discuss the modern food system and the problems it creates for nutrition, health care, elder services, cultural preservation, local economies, and the natural environment. 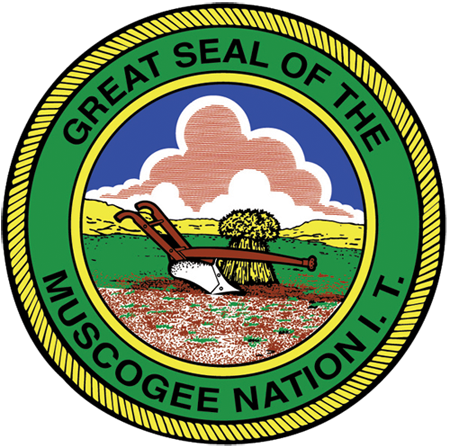 The great seal of the Muscogee (Creek) Nation, adopted in the nineteenth century, features a plow and a sheaf of wheat in an open field, testimony to the ancient agricultural heritage of the Mvskoke people. But the forced allotment of tribal lands a hundred years ago broke up these communal traditions, and today few Mvskokes are involved in producing their own food. Now incorporated as an independent nonprofit, MFSI supports sustainable agriculture, economic development, community organizing, and cultural education among “the Mvskoke people and their neighbors” in eastern Oklahoma. Food is connected to just about everything else in Mvskoke life, including politics and religion. Many of the matrilineal clans take their name from a game animal, domesticated plant, or other indigenous staple: Ecovlke (Deer clan), Vhvlvkvlke (Sweet Potato clan), and Ocevlke (Hickory Nut clan), for example. The Mvskoke calendar culminates in posketv, known in English as Green Corn, a four-day ceremony celebrating the harvest and the beginning of a new year. And sovereignty is the dominant trope of Indian affairs, at least under the current federalist regime, so it’s not surprising that grassroots leaders would associate sustenance with self-determination in launching the Mvskoke Food Sovereignty Initiative. One of the first MFSI projects was a 2006 event on “Food as Medicine,” where tribal elders and health experts discussed the nutritional benefits of traditional foods. More recently, their “Return to Your Roots” symposium in the spring of 2009 brought together more than a dozen presenters exploring the historical, cultural, spiritual, and practical aspects of food sovereignty. This landmark event was cosponsored by the Muscogee (Creek) Nation, and all three branches of tribal government were represented among those who addressed the audience. Indigenous leaders have always worked to sustain tribal sovereignty, and many are now pioneering uniquely indigenous approaches to sustainability in an era of climate crisis. Heritage farming isn’t the only answer, but it’s a start—especially in an impoverished, rural corner of Indian country. Earlier this year, MFSI bought a tiller and helped more than thirty area households break ground on family gardens. And they’re already working with a second Mvskoke community to establish another communal plot, this one in a county that the Kerr Center for Sustainable Agriculture has classified as a “food desert,” where residents have poor access to supermarkets, much less homegrown produce. With a little rain and some hard work, Mvskoke corn and pumpkins may be sprouting all over the Muscogee (Creek) Nation someday soon.